FILE - A man gestures at U.S military vehicles driving in the town of Darbasiya next to the Turkish border, Syria, April 28, 2017. U.S. forces in Syria have a plan in place for their much talked about withdrawal, but it will likely not see all of them leave the fight against the Islamic State terror group anytime soon. 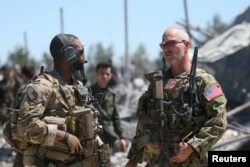 The 2,000 U.S. troops in Syria as part of the fight against the Islamic State terror group have "an approved framework for the withdrawal," Pentagon spokesman, Commander Sean Robertson, said Monday, adding commanders are "now engaged in executing that withdrawal." "That framework is conditions-based and will not subject troop withdrawal to an arbitrary timeline," Robertson said. Robertson said the Pentagon would not discuss any specifics, citing security concerns, but that a number of factors, including the weather, would impact how quickly troops return home. He also said the Pentagon would provide "a periodic update on progress regarding percentages of equipment removed from Syria." Word of an approved withdrawal framework came just hours after U.S. President Donald Trump took to Twitter, criticizing media coverage of his decision last month to immediately begin pulling U.S. forces from Syria — a decision which led to the resignation of former Defense Secretary Jim Mattis days later. "Our boys, our young women, our men, they're all coming back and they're coming back now," Trump said in a video posted on his Twitter feed Dec. 19. At the time, administration officials predicted the withdrawal would take about 30 days. But since then, senior U.S. diplomatic and military officials have slowly pushed back the timeline. This past Friday, a senior State Department official said there was "no timeline" for the withdrawal. By Sunday, U.S. National Security Adviser John Bolton, on a trip to Israel and Turkey, told reporters any pullout would be based solely on conditions on the ground. But Trump on Monday denied there was any change in the U.S. approach to Syria and IS. "No different from my original statements," he tweeted. "We will be leaving at a proper pace while at the same time continuing to fight ISIS and doing all else that is prudent and necessary!" He later posted a more broad defense of his decision to withdraw troops. "Endless Wars, especially those which are fought out of judgement mistakes that were made many years ago, & those where we are getting little financial or military help from the rich countries that so greatly benefit from what we are doing, will eventually come to a glorious end!" Military officials said Monday that while the initial stages of the U.S. pullout from Syria are under way, U.S. and coalition forces would continue to support its partners and allies in the fight against IS. Since Trump's initial announcement, U.S. and coalition planes have continued to bomb IS positions in the group's last remaining strongholds in Syria's Middle Euphrates River Valley. FILE - U.S. forces are seen at the Kurdish People's Protection Units (YPG) headquarters after it was hit by Turkish airstrikes in Mount Karachok near Malikiya, Syria, April 25, 2017. Officials said the steady bombing campaign has helped reduce the terror group's communication and propaganda capabilities by almost half. It also has allowed the largely Kurdish Syrian Democratic Forces (SDF) to make significant gains on the ground, liberating the towns of Hajin, Abu Hassam and Kashmah from IS control. But a key concern has been what happens to the Kurdish fighters once the U.S. leaves. U.S. withdrawal could allow Turkish troops to move against Kurdish fighters in Syria who have played a key role in the war against IS but are deemed terrorists by Ankara. Turkey considers the Kurdish fighters, known as the Syrian Kurdish People's Protection Units or YPG, to be linked to the PKK, a Kurdish group that has waged a decades-long insurgency in southeastern Turkey. "We don't think the Turks ought to undertake military action that's not fully coordinated with and agreed to by the United States at a minimum," Bolton said Sunday, "so they don't endanger our troops, but also so that they meet the president's requirement that the Syrian opposition forces that have fought with us are not endangered." 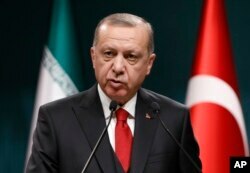 Turkish President Recep Tayyip Erdogan said Tuesday that Bolton made a "serious mistake" and that Turkey cannot accept any conditions related to the Kurdish fighters. In an opinion piece published on The New York Times website Monday, Erdogan however praised Trump for making "the right call to withdraw from Syria." FILE - Turkey's President Recep Tayyip Erdogan talks during a news conference at the Presidential Palace in Ankara, Dec. 20, 2018. "The United States withdrawal, however, must be planned carefully and performed in cooperation with the right partners to protect the interests of the United States, the international community and the Syrian people," he wrote, adding Turkey "is the only country with the power and commitment to perform that task." But Erdogan also warned that Turkey would continue to work to defeat all terror groups, including the YPG. "Turkey will continue to do what it must to ensure its own safety and the well-being of the international community," Erdogan wrote. "Under Turkey's watch, the Syrian territories that are under the control of the YPG or the so-called Islamic State will be governed by popularly elected councils," he added. "Individuals with no links to terrorist groups will be eligible to represent their communities in local governments."